I have some other pictures that don't really fit into the other pages, so I thought I'd make up a new page with them, and a brief explanation about them. 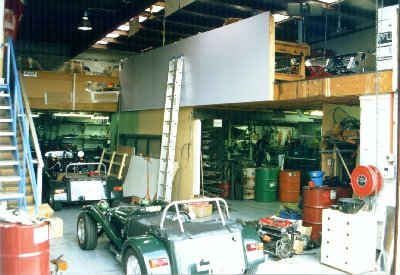 One of the best places to visit in New Zealand is the factory that makes the Fraser Sports car . They're a modernised version of the Lotus Super Seven, but are far more advanced and have a great deal more power and improved handling. They're also one of the quickest accelerating road cars you can buy - 0 to 100kph in about 4 seconds fast enough? Neil Fraser's factory is on the north side of Auckland, and is well worth a look if you are in New Zealand at any time. This is the entrance to the factory. Here's a rather fast Fraser that's half finished. 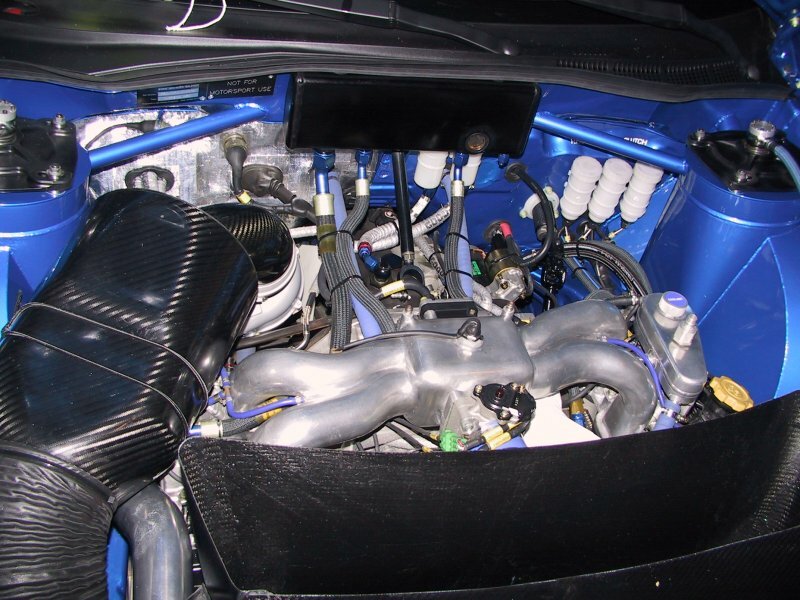 It's got a Toyota 3SGTE turbo twin cam two litre engine in it, and should make well in excess of about 300hp. The latest news I have is that the car is now finished, and is terrorising the streets of Auckland. 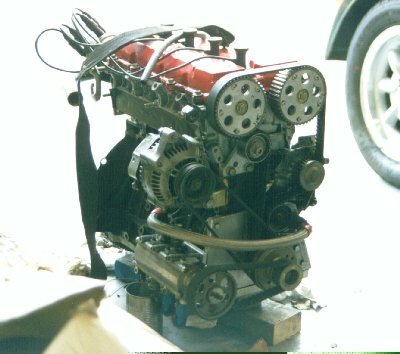 This is a Toyota 3SG engine that most Fraser's use. 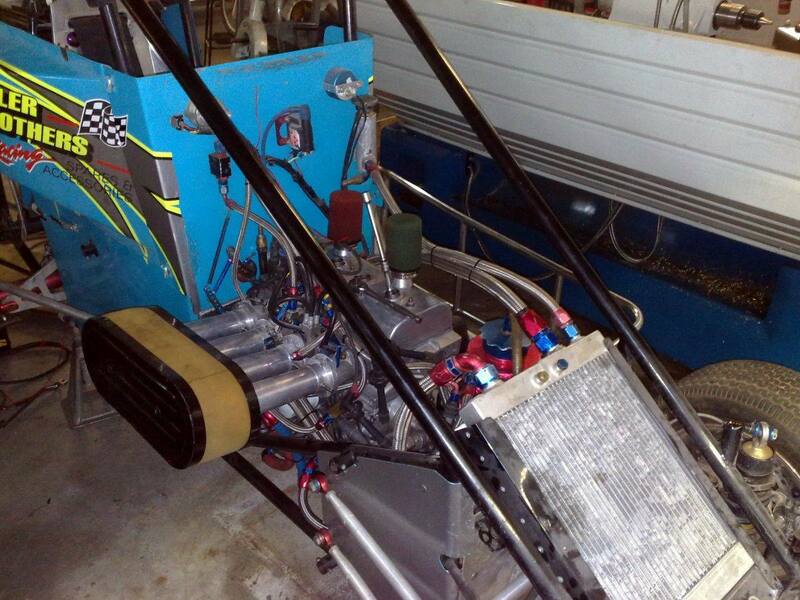 With a few simple modifications, they can make a good 200hp, and so give the car an excellent power to weight ratio. This one makes over 230hp, though is mainly used for racing. 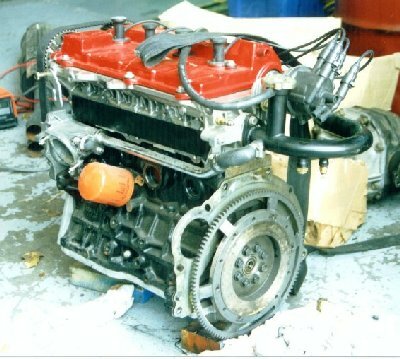 In the right hand picture, you can see the that the engine is dry sumped, and also the scavenge pump on the front-right hand corner of the engine. It also has adjustable cam wheel to let you accurately adjust the cam timing. This Neil's own Fraser , and is a darn fast car. It's probably faster on a drag strip than just about all of the Ferrari's, Lamborghini's, etc. It's got well over 200hp, and goes like you wouldn't believe! It's also road registered - You can get away with just about anything in New Zealand! A bit of trivia - With the imminent closure of all of the major car manufacturing plants in NZ, the Fraser factory will be NZ's largest car maker. He also sells cars to just about any country in the world, so if you're interested give him a call on +64-9-4820071. Just around the corner from the Fraser factory is another workshop that caters for Porsches. To my surprise, they had a genuine 962 Le Mans type being painted up there. It wasn't there for long, so this is the only photo I could get of it. 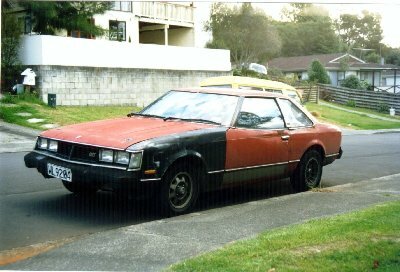 While I was living in New Zealand, I borrowed a 1980 Celica off a friend of mine. It's a cheap spare car that he made up, and it beat the stuffings out of walking! In the right hand picture, it's cunningly disguised as the Auckland Battmobile! 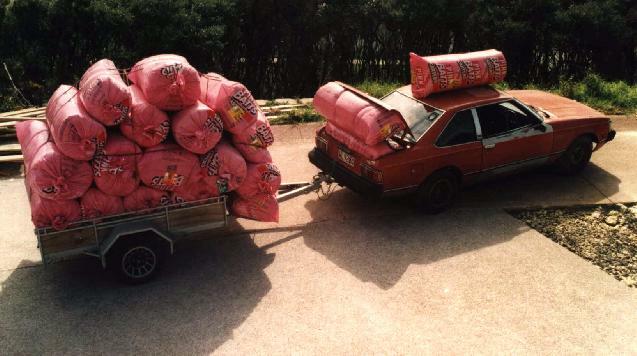 :) The guy that owns it needed to transport 20 packs of ceiling batts. We all said it couldn't be done. We were wrong. This is a newer Celica that we were fixing up when I was in NZ. It's a 1985 TA-63 Celica, and has a 1.8 litre turbo twin cam 3TGTE in it that makes about 160hp. 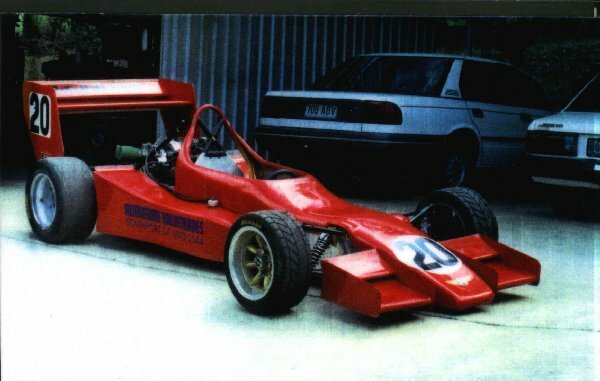 After we finished the bodywork, we were focusing on the engine and hoping to get about 300hp from it, but it got sold before we could get around to doing that, for various reasons. This is a special car - It's a pure hillclimber, built by another friend, John Wynne. John worked for Ford Australia in the 'good old days' and did an amazing amount for them - He built most of Alan Moffat's race winning V-8 Fords, and perhaps is most famous for the major force in the mighty Ford Falcon GTHO Phase 1, 2, 3, and 4 grunters. At the time, they were the fastest 4 door cars in the world, powered by a Ford 351 Cleveland V-8. John's done so many things that I could hardly begin to list them, but to give you an idea, the car you see above is the 77th he's built! - And that doesn't include the ones he built for Ford. 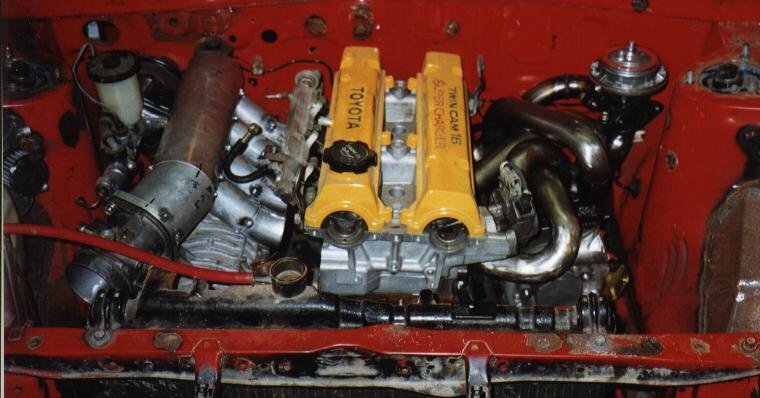 He's gone and built himself a Toyota Starlet - which normally come with a 1200cc or so size engine - and fitted it with a 1.6 litre 4AGE twin cam engine. But he wanted a bit more, so he's also added a supercharger AND a turbocharger! Bit of a weapon, huh? 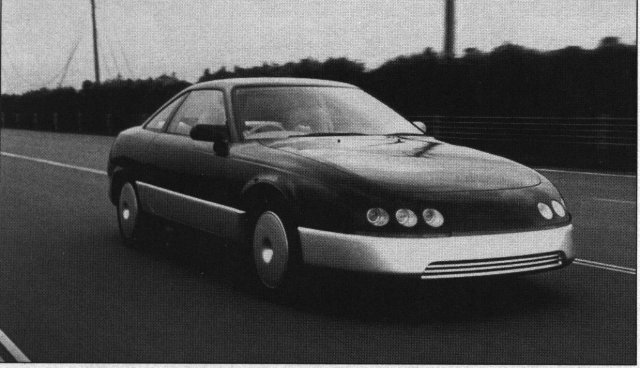 This one is another odd one - It's an experimental car run by Toyota (who else? :) ) that's powered by a small turbine (jet) engine. I think it was investigated in the early to mid 80's, but unfortunately nothing became of it. 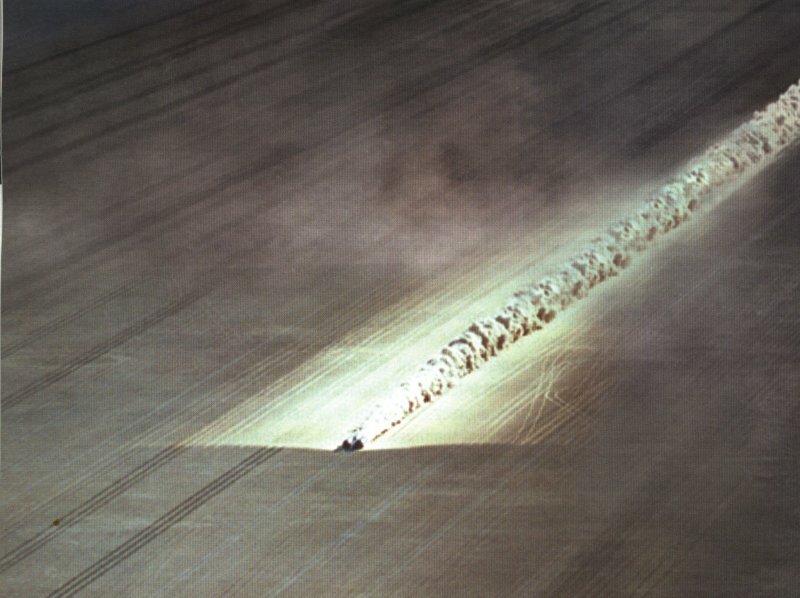 This is the Thrust SSC (Super Sonic Car) running along the Black Rock Desert at just over Mach One. 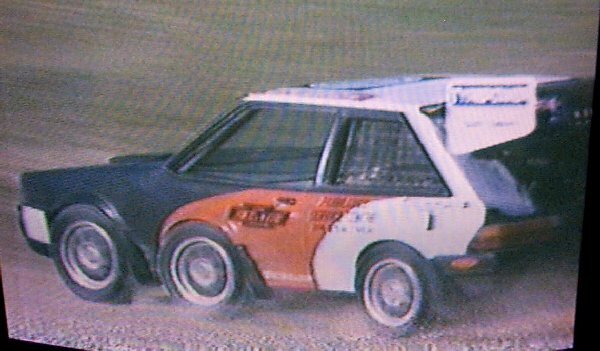 Note the strong shock wave coming off the nose of the car, ripping up the desert sand. This photo was taken from an ultra-light spotter plane, on 15-10-97. This is the unsuccessful Honda NR500 Formula One 500cc Motorbike Grand Prix engine. 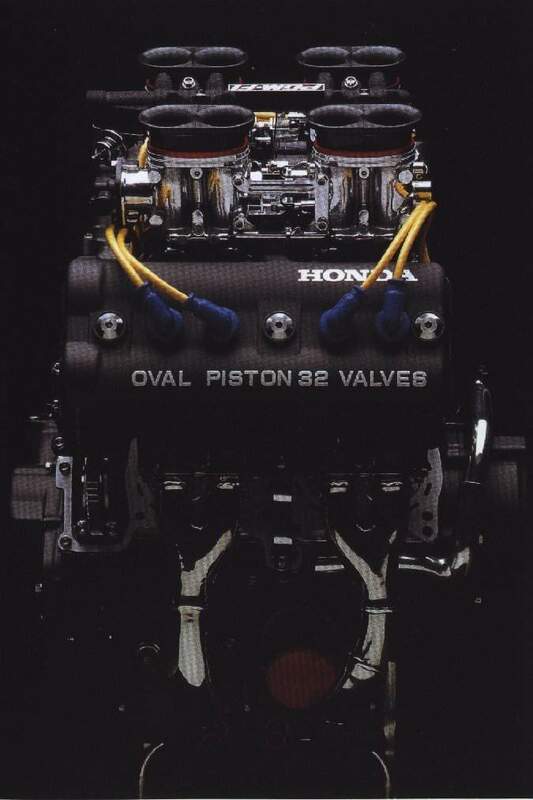 Honda, a traditionally 4-stroke engine designer, decided to try something radical to try to make as much power as the 2-stroke engines that were starting to dominate the 500cc GP class. They did their sums, and decided that they needed eight valves per cylinder to make enough power, and so the oval piston engine was born. 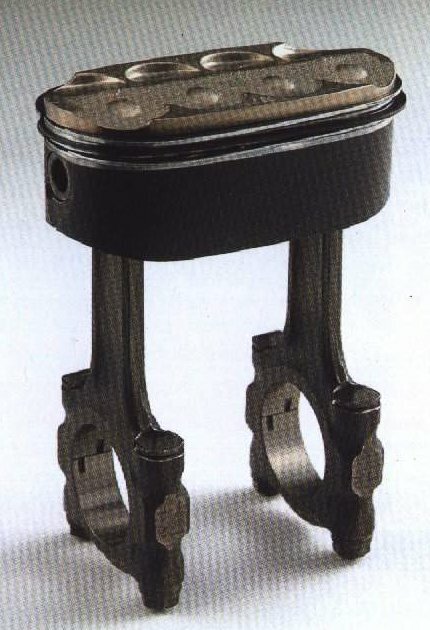 As you can see, the odd shape of the pistons required them to have two con-rods each, and if you look carefully you'll see that they also have two spark plugs each as well. The engine made it's debut in 1979 in the NR500 (New Racer 500cc) bike, but it was plagued with oil control problems with the rings, not surprisingly. Honda tried and tried and tried to make it work, but after many blow-ups they gave up trying to do it in the public spotlight and the engine was 'retired'. They persisted though, and it ran in the 1987 Le Mans bike Gp in 750cc form. It qualified in 2nd place, but a con-rods bolt let go very early so the race was over all too soon. It made about 180hp from 750cc, which is not bad. 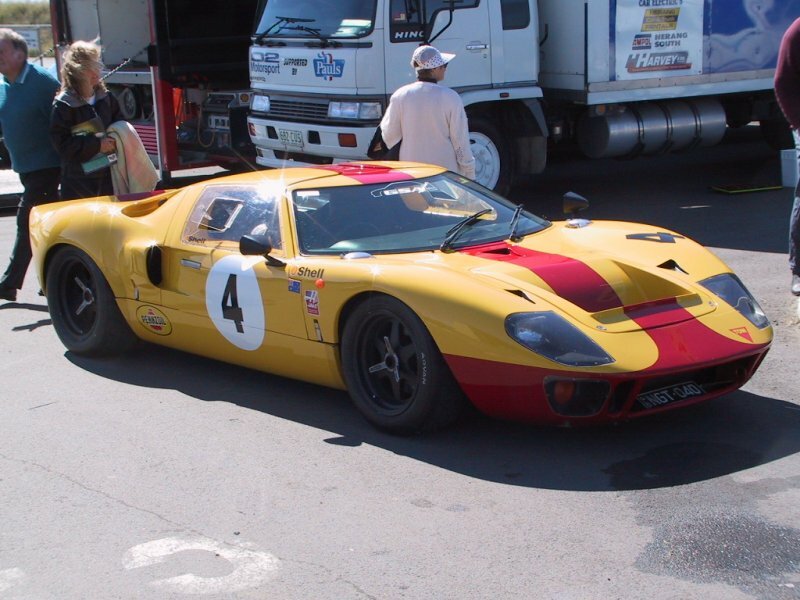 At the first Willowbank race meeting I went to, there was this lovely Ford GT40 replica, powered by a Ford 302 V-8. It gets the '40' part of its name because the top of the roof is a mere 40" (~ 1.0 metre) above the ground. 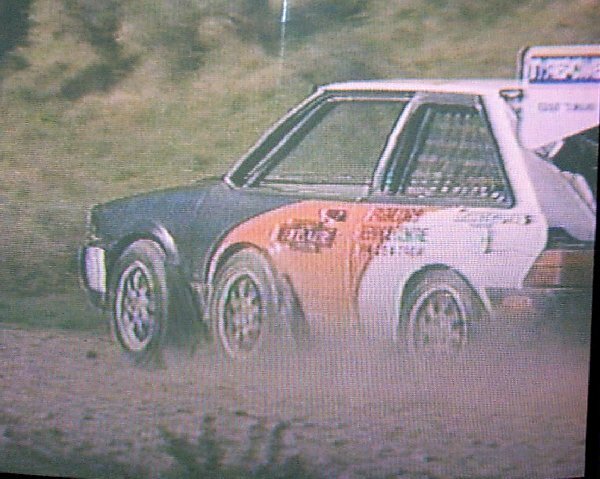 In July 2001 I was lucky enough to be in the UK, and was able to travel to watch a round of the UK hillclimb championship. 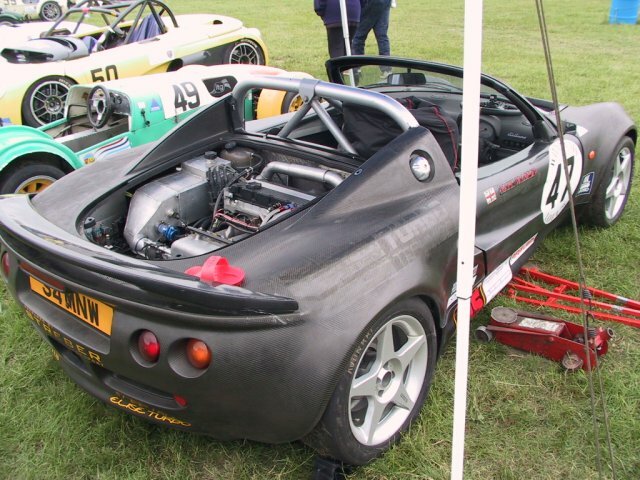 This carbon-fibre bodied Lotus Elise was there, and I believe that it was originally build under special order for Adrian Newey of McLaren Formula One designer fame. The usual Elise is very light, so this one must be extremely light and stiffer as well. 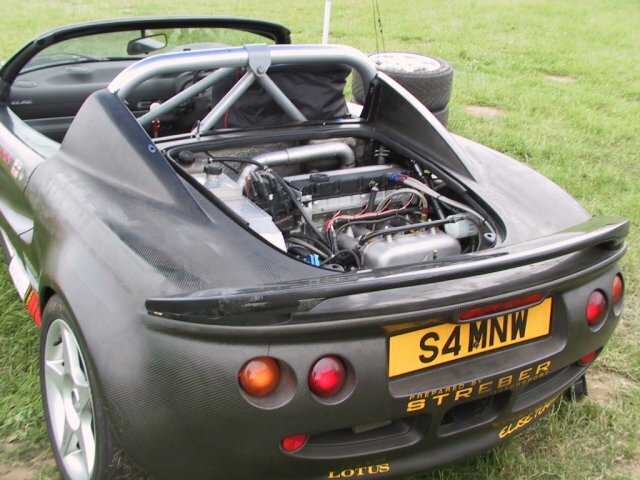 To top it off, it also has a factory fitted turbo 1.8 litre twin cam engine, so it no doubt goes extremely fast as well. Also at the hillclimb was the car on the left, which in fact won the day. 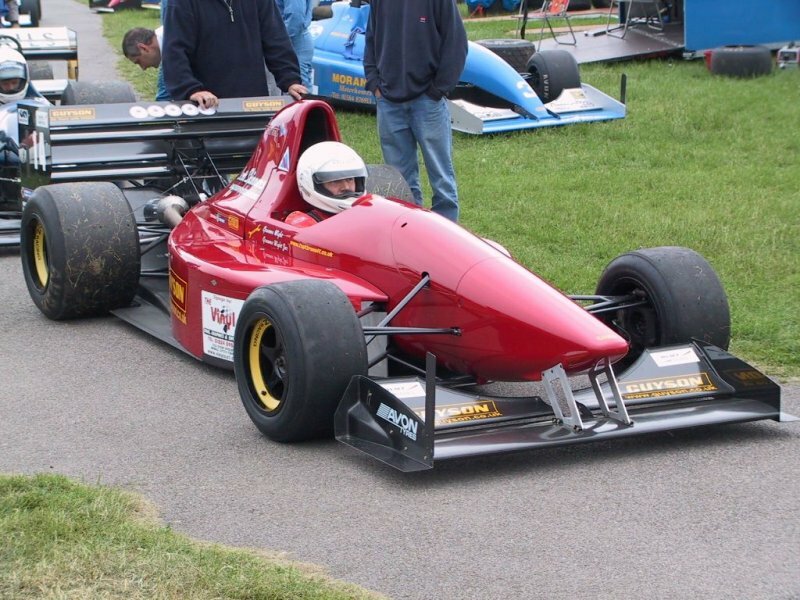 It's a specially built Gould Hillclimb car, and is powered by a Volkswagen V-6 2.5 litre. The engine on the right was in another Gould, and it's a 3.9 litre Judd V-8, and is basically a stroked 3 litre Formula One Judd engine. Sounded awesome! In October 2001 I was giving serious thought to buying this car. Yes, really! 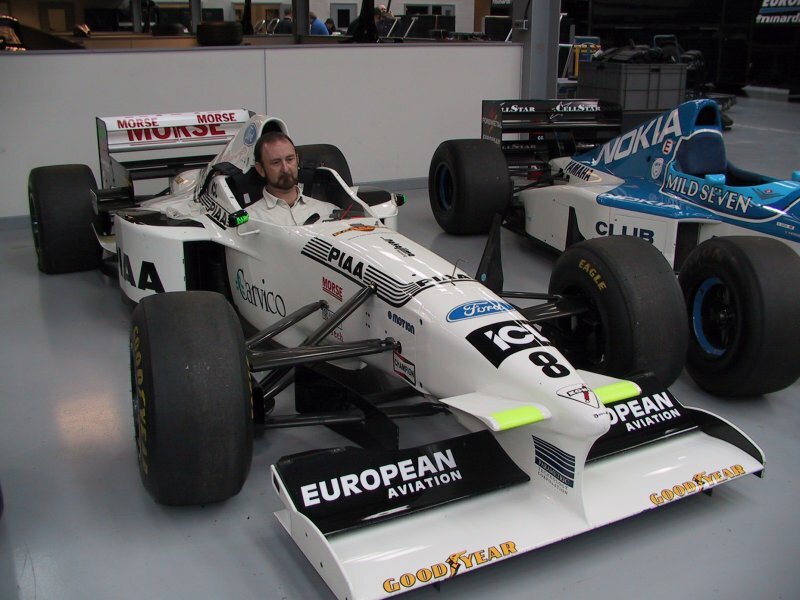 It's a 1997 Tyrrell 025 Formula One car, powered by a 3.5 litre Cosworth V-8 engine of about 750hp. I made an offer on it (part payment, with the remainder in the months to come) but the company that owned it preferred to wait for a buyer that had the entire amount in one lot. 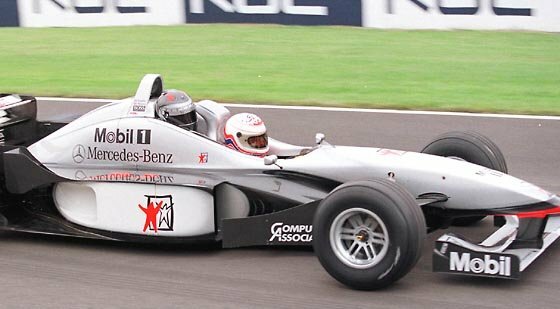 The reason that I picked that car was that out of all the F1's ever made, the 025 is about the only one that I can fit into. There is also only one that has a 3.5 litre V-10, so it has more power than the 'regular' 3 litre V-10's do. I really like to try to buy the car at some point, though it's unlikey to happen. 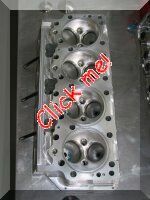 This is a Top-Fueler cylinder head that I saw at the balancing shop when I had some of my engine internals balanced. These engines make over 5,000hp from about eight litres. 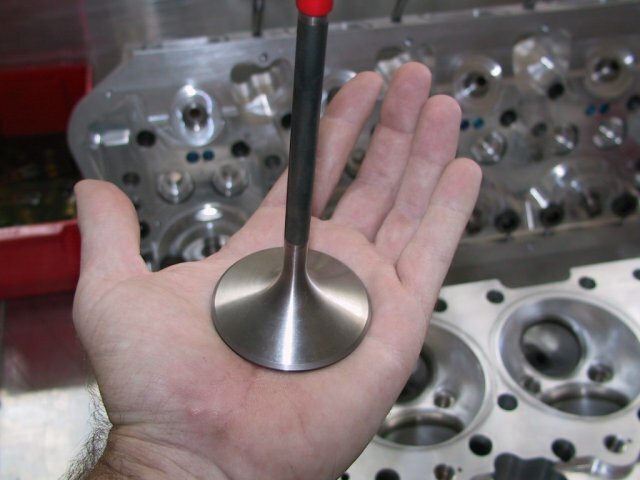 Note the HUGE size of the titanium inlet valve. Speaking of big engines, how about this one??? It's a massive Sulzer diesel, and it makes about 98,000hp at 100rpm. 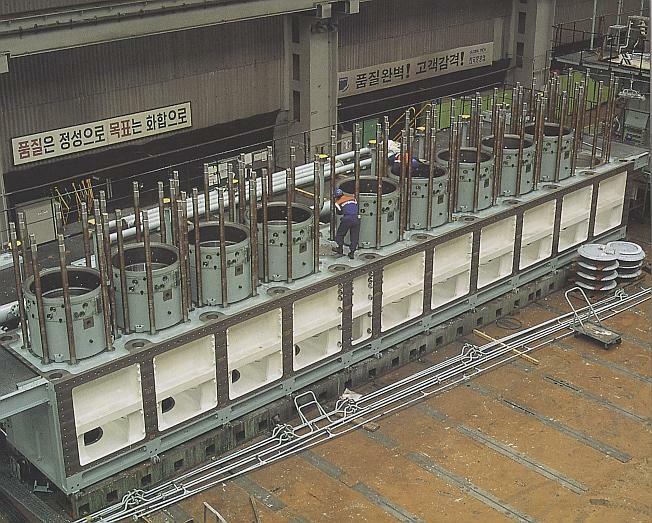 From left to right, the engineers put the huge bearing shells into the block. 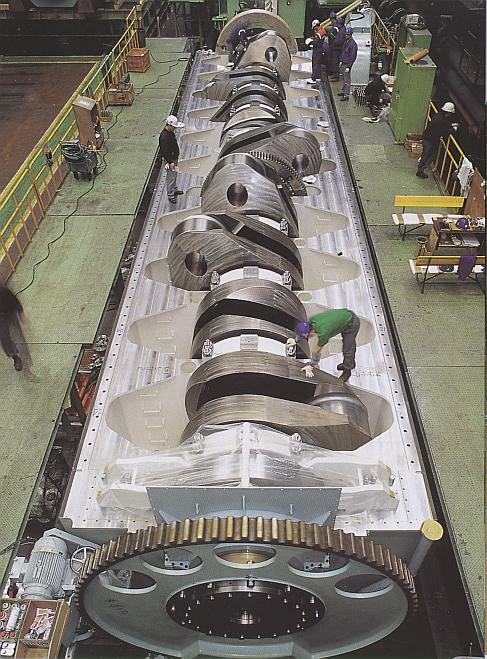 Then they lower the massive crankshaft. 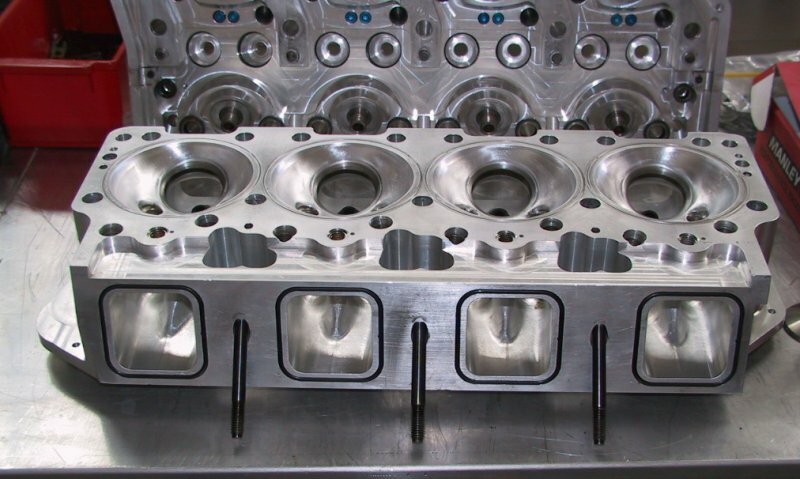 Then the ten cylinder block is flipped over and the cylinder sleeves are fitted. Finally the engine is ready to be fitted to a ship. Please note the size of the people in all the photos, and also the steps inside the crankcase in the 2nd pic! 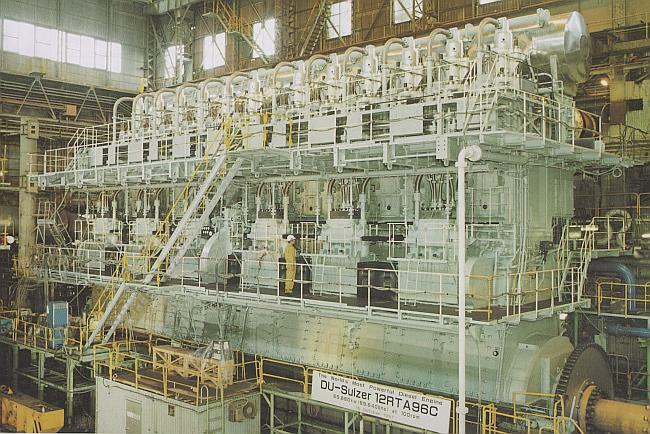 Some more information on the engine - The Wartsila NSD (Sulzer) RTA96-C two-stroke diesel engine is the most powerful and most efficient piston prime-mover in the world today. Bore - just under 3'2" (965mm), Stroke - just over 8'2" (2489mm). 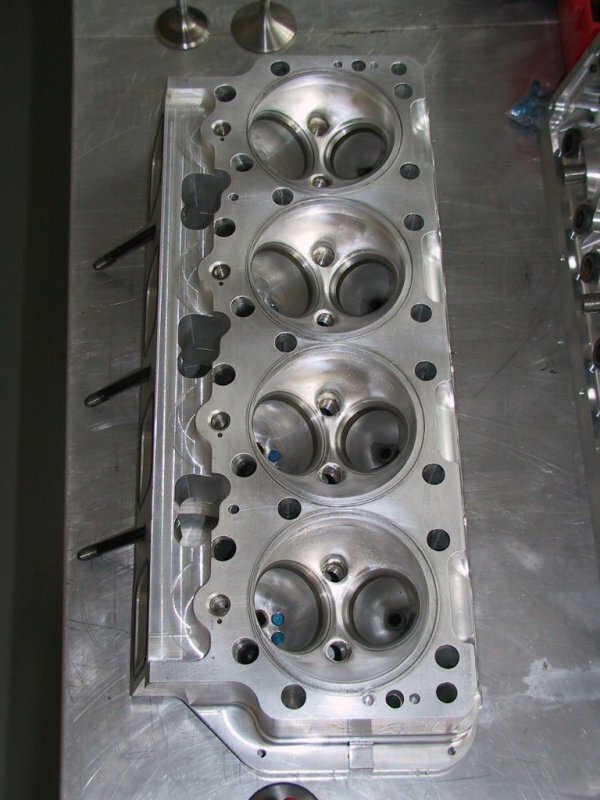 Available in 6 through 12 cylinder versions (all inline). 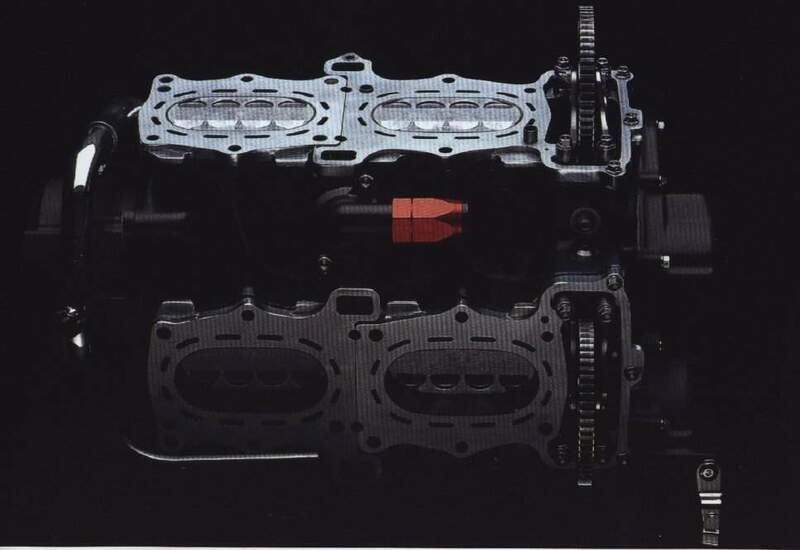 Engine weight exceeds 2000 tons in the 12 cylinder version (the crankshaft alone exceeds 300 tons). Point of maximum continuous power is 89,640 HP (66,844kW) at 100RPM with the 12 cylinder version. Point of maximum fuel economy is 53,244 HP (37,704kW) at 90 RPM. 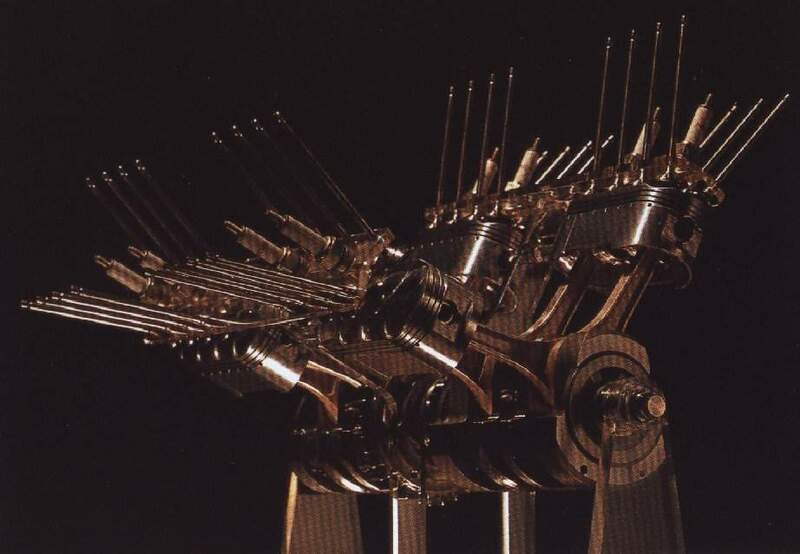 The 12-cylinder engine exceeded 100,000 horsepower during overspeed testing (all of 101.5 RPM!) 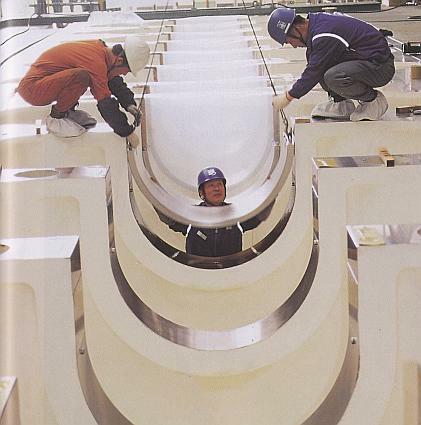 while under test at Japan's Diesel Union works (who built the first engines and from who these pictures are taken). Fuel consumption at maximum power is 0.278 lbs/HP/hour (BSFC). Fuel consumption at maximum economy is 0.260 lbs/HP/hour. At maximum economy the Sulzer engine exceeds 50% thermal efficiency (i.e. more than 50% of the fuel going into the engine is converted to power). For comparison, consider that automotive and small aircraft spark-ignition engines have British Standard Fuel Consumption figures in the 0.40-0.60 lbs/HP/hour range and 25-30% thermal efficiency. Caterpillar 3516s consume roughly 0.42lbs/HP/hour of diesel (unknown thermal efficiency). Even at its most efficient power setting, the Sulzer 12 cylinder consumes nearly 1,660 gallons of heavy fuel oil an hour. 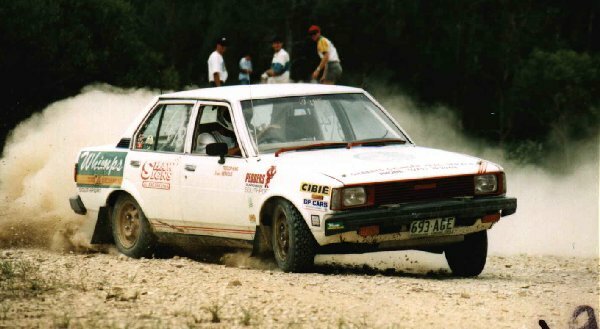 On one of my flights around the world, we carried a Subaru WRX Imreza STi Group A World Rally Car - However, it was a demo car and not the real thing. But it's got virtually all the parts that the real ones do though I'd say only the engine & drivetrain internals would be stock. The first photo is the car sitting on the ground before the flight. The second photo is in flight, when I snuck back to have a look at it, and it's sitting next to the big rear door of the 747 freighter. 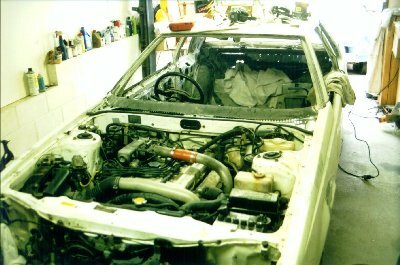 The third photo shows the engine bay with all the carbon fibre bits & pieces, and if you look up on the firewall you can see the placard "NOT FOR MOTORSPORT USE" so it's a demo car only. 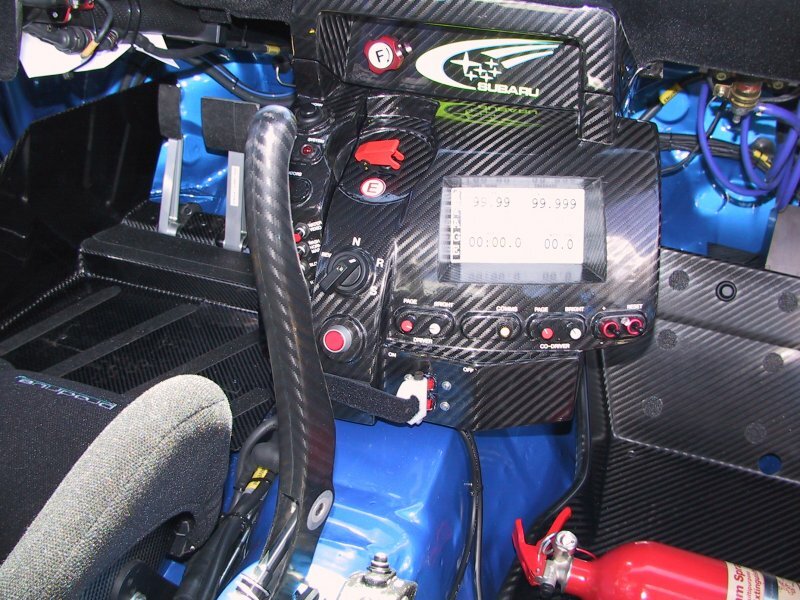 The last photo is from just over the navigator's seat, and again you can see all the carbon fibre that goes into making such a car. I was wandering around Dubai in June 2003 and passed by a Bently dealership. 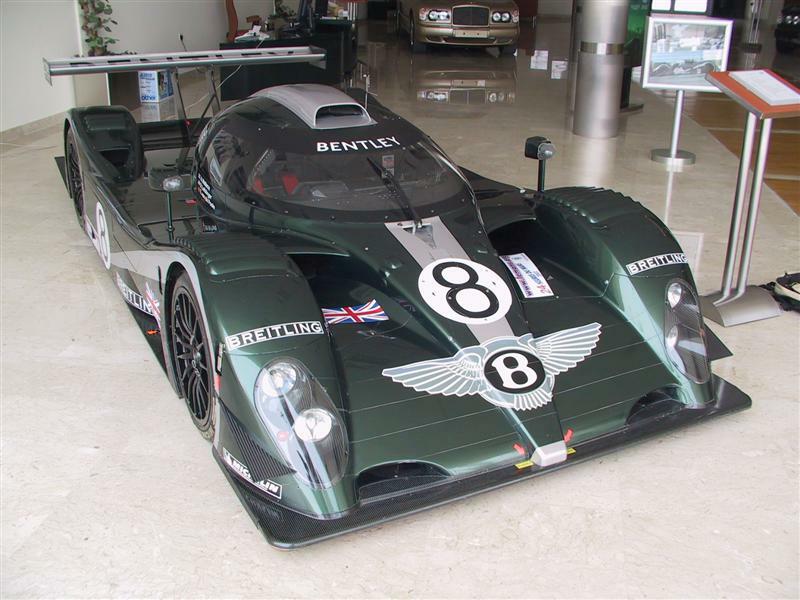 Sitting in the showroom was a 2002-spec Le Mans racer. The spec sheet said "In excess of 600hp" and "In excess of 215mph". Without a doubt I'd say, with a twin-turbo V-8 pushing it along. My interest in cars and motorsport was sparked off by my Father. Some of my earliest memories are of watching him run around at the old Surfers Paradise International Raceway and Lakeside, both in Queensland. 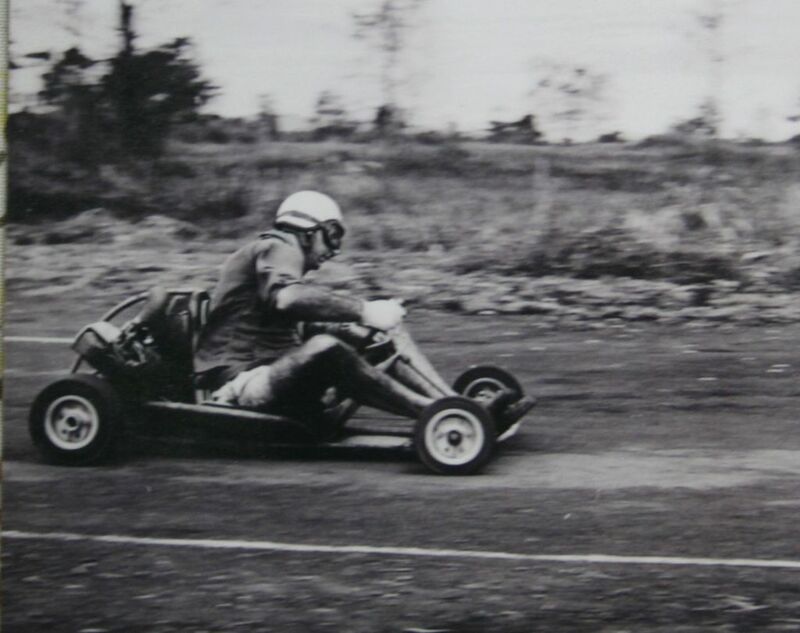 On the left is him running around in his kart in Papua New Guinea, some time in the late 1950's to early 1960's. He would have been late 20's early 30's in that photo. 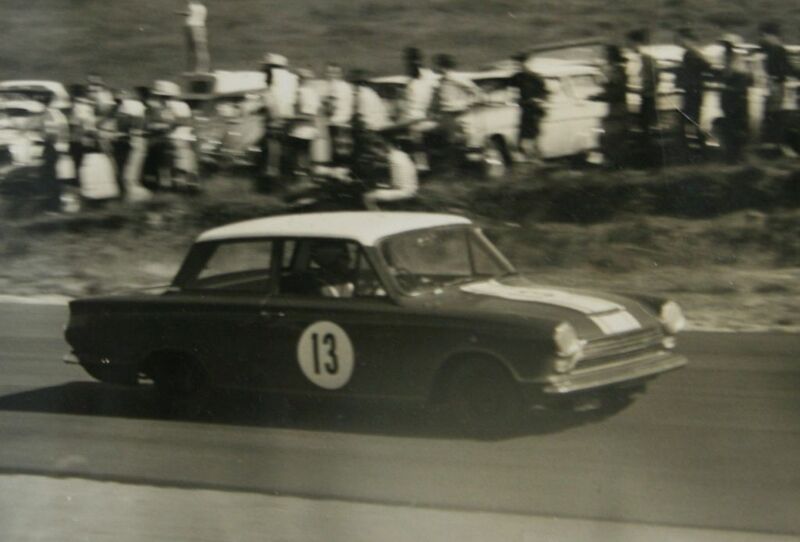 On the right is his last racing car, a Ford Cortina Mk1. He ran that from the mid 1960's up until around 1970 odd. It originally had a Ford 1600 OHC in it, but in the quest for more power and speed Dad managed to squeeze in a huge Ford 302 Windsor V-8 of about 450hp. It made the little car very nose-heavy and so not so good in handling, but it made up for it in a straight line. 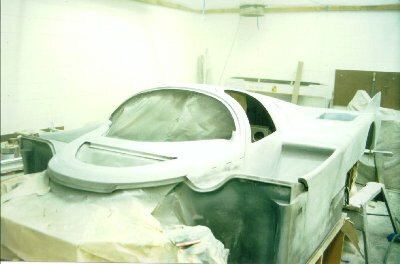 He says that with the big hole he had to make in the firewall, it reduced the stiffness of the bodyshell so much that he could see a part of the floor crease, uncrease, then crease up again as he changed gears! 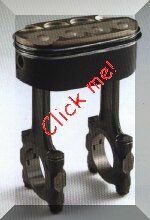 Early in 2009 I helped a friend of mine rebuild a Renault two-valve pushrod engine for a speedway car. The engine had been extensively modified, with a lightened crankshaft, high-compression pistons of about 15:1 or so to run the methanol they use, and many other little tweaks. 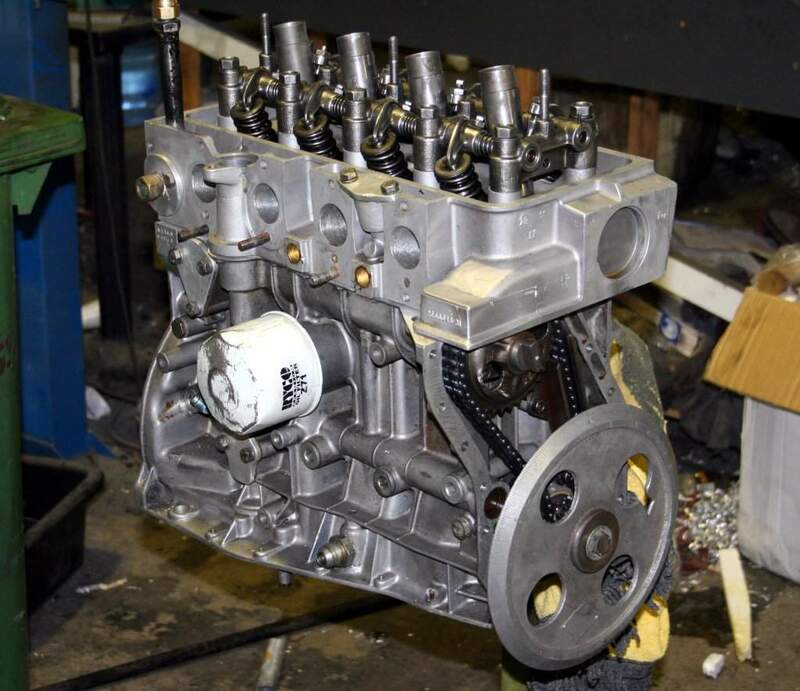 I've never seen one before and although I'm certainly not a fan of push-rod engines this one was quite nicely done - The camshaft sits very high in the block so the push-rods are quite short and so stiff & light. One of the things I changed was to remove the springs between the rockers and replace them with solid tubes, to stop the rockers from moving around at high revs. 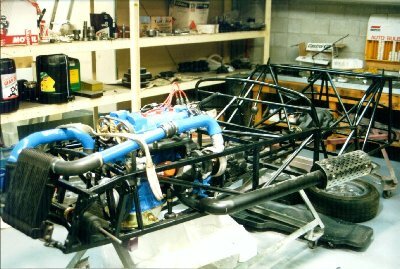 On the right you can see the engine back in the car and all the constant-flow methanol injection gear needed to run it. 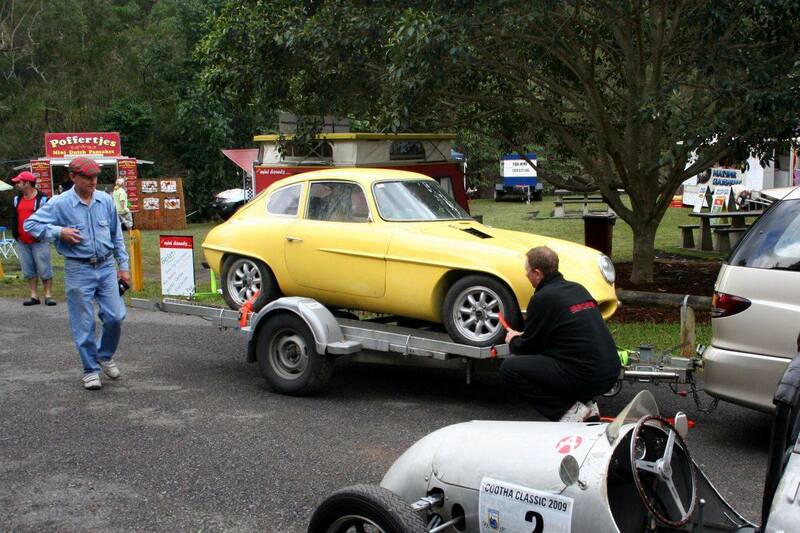 In late May 2009 I was invited by the editor of the excellent Aussie motorsport magazine, RACE, to drive his Rochdale Olympic at the first Cootha Classic hillclimb. Since the owner, Neil, is even taller than I am I knew I'd fit into the car and said yes. That's the car on the right, and it was built in the UK in 1964 and has a completely fibreglass shell - no metal. The engine is a two litre Fiat of about 150hp and with such a light car it goes quite well. 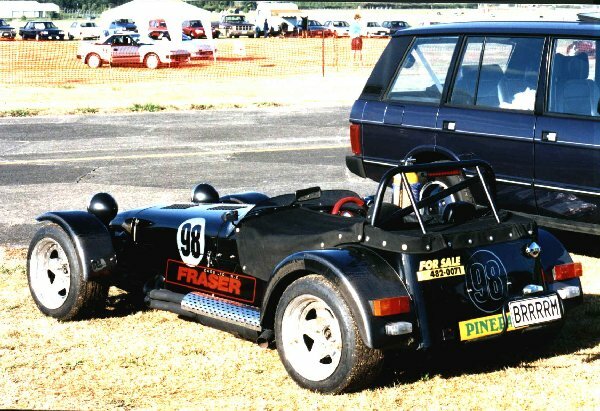 It had a few little problems that kept it from being driven as quickly as it should have, but it beat quite a lot of other cars in the class. 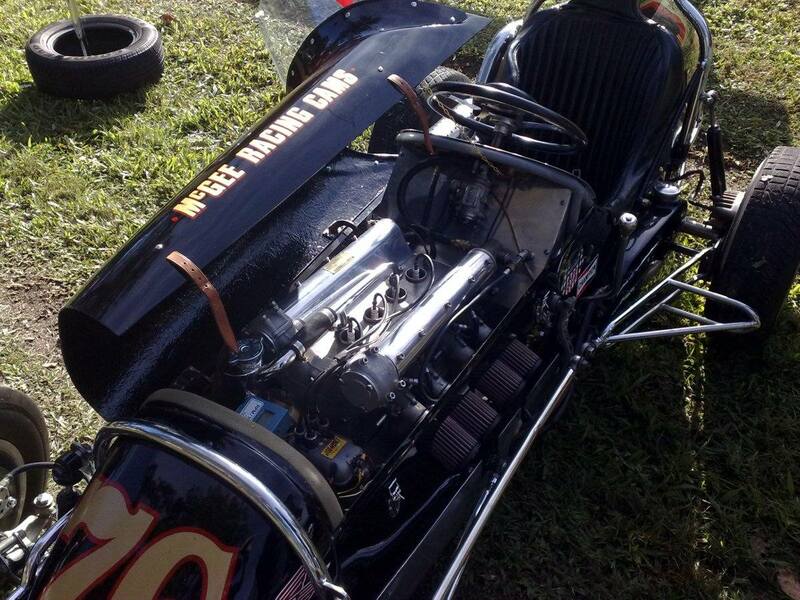 One of the other many cars of interest at the event was an old speedway beast that had a legendary Offenhauser four-cylinder engine in it. I'd heard a lot about them but had never seen one up to that point. This one even had an original Joe Hunt magneto on it. The Offy's dominated US racing for the best part of half a century. I fitted my Chasecam video camera to Neil's Rochdale, and got a video of me doing the last run of the day, my smoothest. The car has no LSD fitted so it wheelspins quite a lot off the line and the rear suspension had limited droop travel so I had to be very careful around corners, or the car would swap ends in the blink of an eye. Since it is one of only two in the country and it's older than I am, I decided to take it a bit easy.